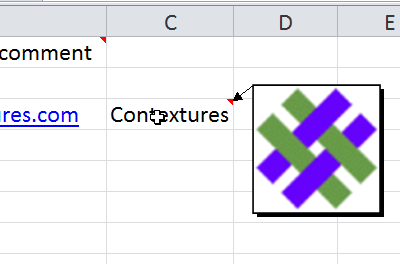 How to change user name in Excel comments, change comment shape, and more tips. Short videos and step by step written instructions. NOTE: Shapes and Pictures are not available with Threaded Comments. Microsoft is introducing Threaded Comments in Office 365, so you might see those soon, if you don't have them already. Before you use Threaded Comments, instead of old-style (Legacy) comments, be sure to understand what features you will lose. Legacy comment features, such as changing shapes, inserting pictures or adding colors, will not be available in Threaded comments. Thanks to Bill Jelen (Mr. Excel) for this warning -- "If you try to edit an old comment, a long message will tell you to Convert to Threaded Comments and all of your comment formatting will be lost." The old-style (Legacy) comments will still be available, but the icons to create and edit them will be hidden. To learn more about Excel Threaded Comments, watch this video by Bill Jelen. Instead of showing the user name at the start of an Excel comment, you can change to something generic, such as "Note:" However, this change affects the User Name in all Microsoft Office programs, so you may want to reset the name before you exit Excel. 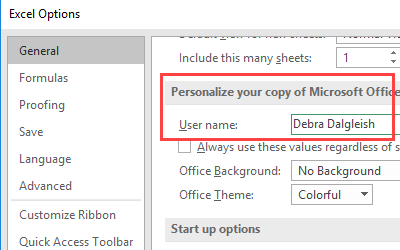 Scroll down to the section, "Personalize your copy of Microsoft Office"
If you want the same comment in multiple cells, you can copy and paste an existing comment. 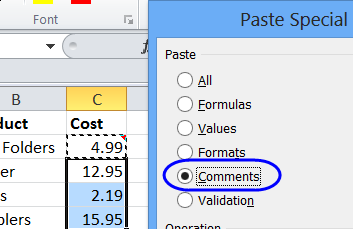 Select the cell(s) where you want to paste a copy of the comment. Add a bit of interest to a worksheet, by changing the comment shape from a rectangle. NOTE: Shapes are not available with Threaded Comments. 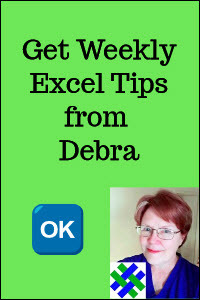 Watch the video, to see the steps for in Excel 2007 or later. Written instructions are below the video. Click here to go to the instructions for Excel 2003. Close the Excel Options window. Right-click the cell which contains the comment. Click on the border of the comment, to select it. On the QAT, click the Change Shape command, and click on a shape to select it. When finished, click outside the comment. Choose Change AutoShape, and choose a category. Click on a shape to select it. To see how to add a picture to a comment, watch the steps in this short video. The written instructions are below the video. NOTE: Pictures are not available with Threaded Comments. NOTE: These instructions are for Excel 2007 and later versions. See below for Excel 2003 steps. Instead of text, you can show a picture in an Excel comment. Choose Show/Hide Comments, and clear any text from the comment. On the Colors and Lines tab, click the drop-down arrow for Color. Instead of text, you can show a picture in an Excel comment. Watch the steps in this short video, and the written instructions are below. You can change the font size of new Excel comments by changing the settings in your Control Panel. On the Appearance tab, click Advanced. Comment indicators are red, and there's no option to change that setting. As a workaround, you can draw triangular shapes over the indicators, and fill them with a different colour from the palette. 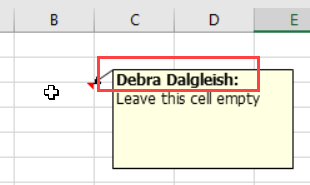 Add a comment to a Data Validation Input Message, and it can be displayed when you tab to the cell. Type your message heading text in the Title box. This text will appear in bold print at the top of the message. Type your message in the Input message box. To see comment shapes and pictures, download the Comment Tips sample file. The zipped file is in xlsx format, and does not contain any macros.